Tag line: "Death has never been closer"
Like the previous entry in the Final Destination series (i.e. 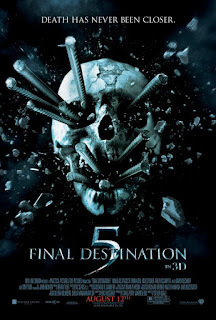 2009’s The Final Destination), director Steven Quale’s Final Destination 5 was shot in 3-D, and as a result, a plethora of sharp objects and mutilated body parts come flying off the screen. Well, as it was with The Final Destination, I didn’t get a chance to see this 2011 film in 3-D, but I’m happy to report that Part 5 features plenty of surprises - and more than enough gore and carnage - to ensure that the 2-D crowd is just as entertained as their three-dimensional counterparts. While he and a busload of his co-workers are on their way to a company retreat, Sam Lawton (Nicholas D’Agosto) experiences a vision in which the bridge they’re crossing collapses, killing most of them (only Sam’s girlfriend Molly, played by Emma Bell, survives the ordeal). When it looks as if his premonition is about to come true, Sam and several others, including his friend Peter (Miles Fisher); Peter's girlfriend Candice (Ellen Wroe); their boss Dennis (David Koecher); and co-workers Olivia (Jacqueline MacInnes Wood), Nathan (Arlan Escarpata) and Isaac (P.J. Byrne), hop off the bus and rush to safety. But instead of a new lease on life, the group realizes, with the help of local coroner Bludworth (Tony Todd), that they’ve only managed to temporarily cheat death, and it won’t be long before the grim reaper comes back for each and every one of them. Anyone familiar with 2000’s Final Destination and its sequels knows exactly what to expect from this 2011 entry: a blockbuster-sized opening catastrophe followed by smaller, yet equally as intense kill scenes. Hell, thanks to movies 1 - 4, we even know the order in which the “survivors” will meet their demise. With the exception of The Final Destination, it’s been a solid formula thus far, and I was amazed how, after four films, the creative minds behind Final Destination 5 still found new and imaginative ways to skewer and pulverize the human body, starting with the impressively-realized suspension bridge disaster (which looked authentic enough to give me goosebumps) straight through to the individual scenes where death catches up with the characters one by one. And like the other Final Destination flicks, you may have a hard time picking your favorite Part 5 kill (mine comes early on, and involves a college gymnastics practice). Throw in a twist at the end that made me positively giddy, and you have a movie that satisfies on every possible level. Like most modern horror films, the blood and gore in Final Destination 5 is computer generated, but even this doesn’t spoil the fun. And Final Destination 5 is fun with a capital “F”!